Mini-Toggle : Want your phaser tones gritty and swooshy, or maybe a little more smooth and rounded? Flip the mini-toggle and choose your style. Set it in the middle and activate the TonePrint functionality for your own custom-made phaser sound. Feedback : Turn this dial for a more pronounced and resonant phaser effect and get ready to feel the feedback. Speed : From slow, evolving sweeps to fast, pulsating spins - it's all there and then some. Just turn this knob and decide how fast you want to go. Depth : Want to tame those sweeps a little? Or maybe go for a full on psychedelic-fest? Turn this dial and find your personal sweet spot. Mix : This controls the overall mix between your dry sound and the phaser effect. Crank it if you want to be heard, or dial it back if you like your phaser tones extreme but low in the mix. True Bypass : Ensures zero tone coloration, letting your tone shine through with no loss of high-end. 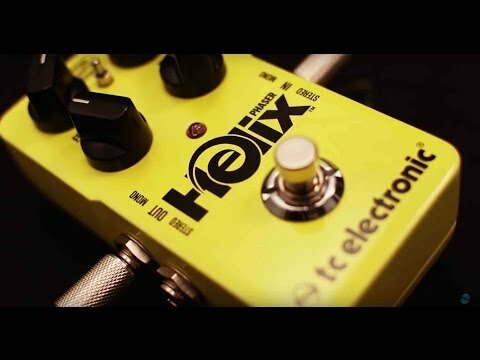 Analog-Dry-Through : Helix Phaser always lets your original sound pass without ever converting it to digital, keeping every nuance in your tone intact with zero latency.